In the Room for Debate feature over at the NYT, Julila Isaacs makes an interesting linkage between lower child poverty rates and higher rates of income mobility. She points out, for example, that Scandinavian countries maintain both lower child poverty rates and more upward mobility. Correlation not being causation, that’s not proof, but it makes sense. It’s also consistent with a fascinating strain of recent literature that tracks people from when they were kids into adulthood to gauge the lifetime impacts of anti-poverty measures of policies like food stamps, Head Start, EITC, and so on. 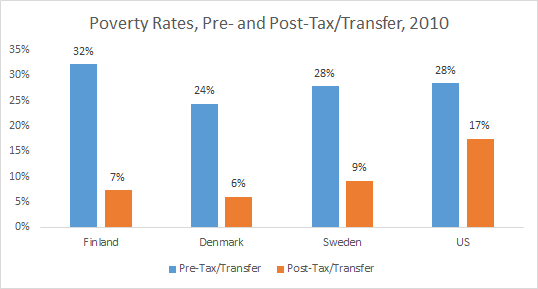 Denmark reduces market poverty by 75%; Sweden by two-thirds; Finland by 80%; the US, by only 40%. So, to the extent that the difference in child poverty rates between here and Scandinavia is a driver of our immobility relative to theirs, that’s not some immutable market outcome. It’s a policy variable. Moreover, in the age of inequality, such anti-poverty policies are more important than ever, as higher inequality creates both more poverty along with steeper barriers to getting ahead, whether through the lack of early education, nutrition, adequate housing, and a host of other poverty-related conditions that dampen ones chances in life. Share the post "Poverty, Mobility, and Policy"
8 comments in reply to "Poverty, Mobility, and Policy"
This would seem to contradict the fear Republicans have that increasing entitlements will reduce the motivation of lower income people to look for jobs and improve their lot in life. It would support Democrats’ belief that helping poor people increases their ability to escape poverty. But there is good news — especially for all three of us remaining Truman Dems. A really effective anti-poverty program described in today’s NYT! There is a labor shortage in California caused by reduced illegal immigration and WAGES ARE GOING UP and going up a lot! And this did not anything to do with raising minimum wages or DOL law enforcement. It had to do with reducing illegal immigration enough to create labor shortages. And wages are going up a lot more than predicted in those silly models that say that illegal immigration reduces wages by maybe 8%. The results of direct observation put the figure at 25% or more in just one year. Can you imagine how much poverty would be reduced if we could maintain this trend for another 5 years? It’s time to make up our minds that the best way to reduce poverty is to raise all wages (which means eliminating employers’ rights to pay less to illegals). All the models that study immigration effects on wages are off because they don’t account for downward nominal wage rigidities. What’s that? It’s what happens to wages of those continuously working during a period when the market supply of labor is greater than demand. The oversupply can be caused by recession, technological innovation, globalization, and of course immigration. Textbooks say wages of everyone should fall in a weak labor market. Common sense and actual studies show this is not true. Employers let some people go, if immigration is involved, often by attrition. But current workers don’t face pay cuts even if new hires are paid less. Wages resist downward movement (they’re rigid). The “nominal” part just means real wages fall easily from the invisible factor of inflation, but not when the number of (nominal) dollars (or euros) paid are in question. The misguided studies of immigration mistakenly assign the resulting wage differential of continuing employee wages vs. new-hire wages (which are lower) to different job categories (imperfect substitution). Krugman repeatedly has argued the reality of wage rigidities in the face of depression is killing Southern Europe. Studying the problem is nothing new, except in the context of immigration. However, I favor continued immigration and also immediate amnesty. What I don’t favor is anything that ties an immigrant to an employer. The fact that both proponents and opponents ignore this factor, the severe wage and employment effects from employer sponsor dependent immigration, implies proponents don’t really care about free labor markets, and opponents are more anti-immigrant than worried about wages. The moral way is to adjust a yearly number, hold a lottery, and let them in, no strings. If you have downward rigidities in wages (or an effective minimum wage), then new labor supply causes one-for-one increases in unemployment, overt or hidden. In any case, downward wage rigidities are hardly a new concept in economics. However, even if you have downward wage rigidities, the California example proves that it doesn’t work in the other directions. Reduce the number of immigrants and wages GO UP. We now see by direct observation that the basic supply and demand model works whether some people like it or not. But I suppose that is a normative choice if you are willing to throw Americans out of work and keep wages from rising in order to help people evacuate poor countries. But remember, any gains they get are coming out of the pockets of America’s poor — even if you want to dispute exactly how they impoverish America’s poor. I, for one, am happy to choose and expand upon Cullyfornia’s recent natural experiment. As for allowing in more immigrants without hurting America’s poor, I would be happy to choose that, but it’s just not possible. Poor form on this one. Siting and comparing Scandanavian Countries to the US. First the total population is less than 25 million (I am being generous). Plus, the lack of diversity in these countries…the social dynamics do not come close to what we deal with in this country Please convey to Ms. iaasacs my disappointment in her argument. Upward mobility is easy when you encourage and foster migration. Providing people the confidence to move to improve their economic situation is the solution. I live outside of Philadelphia. The City has a failed educational system and just 10 to 20 miles away in any of the four neighboring counties are hundreds of top high schools. Yet folks don’t have the courage to move that small distance to improve their families upward mobility. They wait for the miracles of government policies to show up. Migration is how you improve peoples situation. It has been proven since man Has been around. I’ve been to Denmark, Sweden, and Finland. While you don’t see the diversity in skin tones that you do in the USA, their intra- and inter-national ethnic diversity is just as challenging to grapple with as what we see here. So I wouldn’t be so quick to dismiss Ms. Isaacs’ argument on that basis. Recall that it wasn’t too long ago that these nations were shooting at or across each other, with real guns. And they have some pretty serious cultural incompatibilities as well that come from centuries of being conquered, overrun, annexed, and so on. Just trying to compare their languages makes this pretty apparent; some minor controversy over the naming, funding, and design of a certain bridge that connects two of them is pretty decent supporting evidence (Google it). Besides, these nations individually have population sizes that rival those of many of our States, so you might imagine Ms. Isaacs repeating her analysis and comparing e.g. Georgia, New York, and Oregon. Just to throw out three state names at random. As for your comment regarding physical mobility, I’ll just point out that for someone living in poverty, a geographic relocation also means severing ties with a social structure that steps in where our government leaves off. For example, an income situation might turn upside down if a household doesn’t have the free babysitting services of grandma who lives next door to get the kids off the school bus each day. To pick but one example. And given the lousy state of public transportation caused by our fetish for suburban living in the USA, transit logistics for households without a car is also a huge factor. A relocation to even a few city blocks away, as often happens when housing projects are demolished to make way for “better solutions”, can totally upend an already fragile state of existence. Child poverty will affect upward mobility, but perhaps because the parents are hopelessly poor, can’t afford to eat well, work too many hours, argue and fret over money, can’t spend time with their children, and can’t afford a good higher education for them. It’s not the children; it’s the family in poverty.